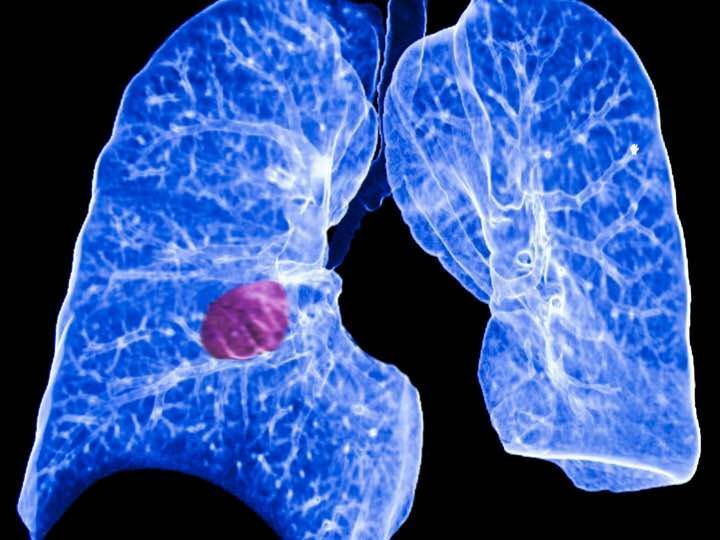 CHICAGO -- Early-stage lung cancer located too close to vital organs for conventional treatment may be amenable to therapy using proton beam techniques, researchers suggested here. Using image-guided hypofractionated treatments to eradicate centrally located non-small-cell lung cancers (NSCLCs), Bradford Hoppe, MD, of the University of Florida Health in Jacksonville, reported a 3-year overall survival rate of 84% for the 16 patients included in the study who had been treated between 2008 and 2015 -- a rate that is at least as good as other reports in the literature for such centrally located lesions, he said at the annual meeting of the Radiological Society of North America. While stereotactic ablation body radiation has been used to eradicate early-stage lung cancers found near the periphery of the lung, there is no consensus on the standard of care for inoperable Stage 1 lung cancer located centrally -- or within 2 centimeters of the proximal bronchial tree or the heart, Hoppe explained. "Hypofractionated image-guided proton therapy offers favorable outcomes with regard to local control, overall survival, and toxicity when compared with stereotactic body radiation therapy," he said, adding that proton therapy should be strongly considered when the target lesions cannot be adequately addressed with stereotactic treatments. In his oral presentation, Hoppe said treatment with proton therapy that is available at his institution appears to be able to ablate those centrally located masses and do the job without causing unacceptable adverse events. Of the 28 patients treated with proton therapy, 16 had centrally located cancers, and received a radiation dose of 60 Gy in 10 fractions. After a median follow-up of 44 months, five of the patients have died: one died 4 months after the procedure, another died after 2 years, and the other died after 4 years. The progression-free survival rate at 3 years was 41%. Regarding side effects, one patient developed Grade 3 bronchial stricture that required hospitalization and placement of a stent; another patient was hospitalized for chest pain on the second day of treatment related to gastrointestinal upset. Six patients developed cough, fatigue, and shortness of breath within 6 months of the procedure, but these events resolved with antibiotics and 1 week of steroids. Hoppe also said that there were multiple admissions due to exacerbation of chronic pulmonary obstructive disease. He noted that a randomized clinical trial of proton therapy in these patients is ready to accrue, but volumetric imaging protocols are needed for use at the proton centers. Still, not every institution has a proton device, cautioned the co-moderator of the session where the results were presented, Matthew Harkenrider, MD, of Loyola Medicine in Chicago. "I think that Dr. Hoppe did note that patient selection is important," Harkenrider added. "If a more traditional stereotactic body radiation plan can't achieve your goals, then protons are a method we should keep in mind. For these select patients, you would want to refer them to a specialty center." In an interview with MedPage Today, Harkenrider also noted that studies such as Hoppe's that have small numbers of patients will require larger trials before they can achieve widespread acceptability. "These studies are generating further hypotheses that will have to be performed by multiple institutions to get the answers that we can apply to a broader population."